Chocolate Pistachio Mousse. Let’s face it. Sometimes you need a little chocolate. That is where this Healthy Chocolate Mousse Recipe comes in. It’s rich, creamy and satisfying. It only takes a little to satisfy you. You can whip it up in minutes too. If you love chocolate, you should also try my homemade chocolate bars or my chocolate flourless muffins. 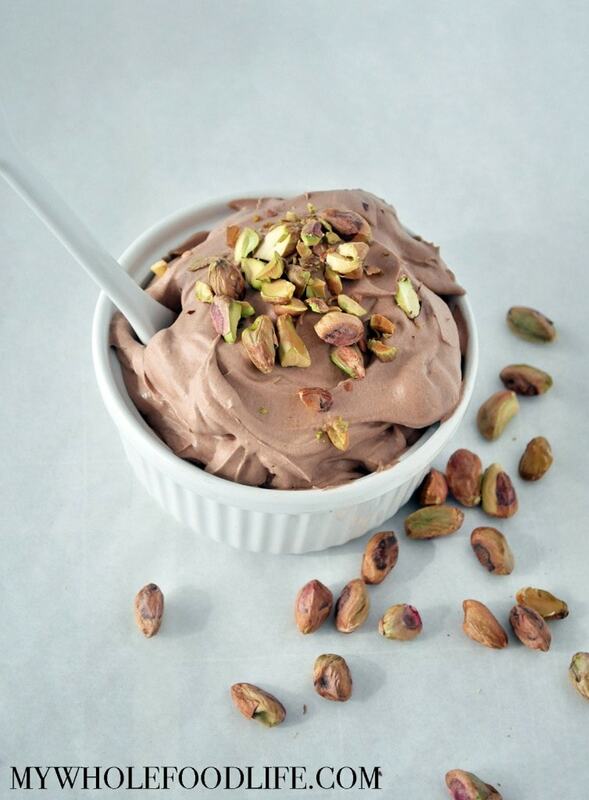 This healthier mousse recipe contains zero refined sugar and takes minutes to make. It’s also vegan, dairy free and gluten free. If you wanted to use another nut, I think you could. I could see hazelnuts being a nice addition too. I shot a quick video of this recipe. You can watch it below. For more videos, you can subscribe to my You Tube Channel. Looking for more mousse recipes? Perfect for those chocolate cravings! Once the can has been refrigerated overnight, open it, scoop out the fatty white part, and place in a mixing bowl. Also add the cacao powder and maple syrup. Using the whipping attachment on your mixer , whip into a mousse. Spoon mixture into serving bowls and garnish with chopped pistachios.